Ever since we started planning the new edition of our house I knew that it would be full of knitting nests and that they'd all need seating - I've just been too afraid to think of what kind. Because even if I have measurements, I really need to stand in a space before I can see how much will really fit in it, and anyway I knew the space-related numbers would be very very bad. But this week, we entered the stage with custom cabinetry and shelving where those decisions have to be made. YAY!! This down-filled, linen-covered settee from the Art Shoppe is incredibly comfortable and I love it - I mean, I really, really love it and want it very badly and have done for well over a year now and I was so excited to see it's still available - but I have to admit, in addition to still not being a favourite with Pete, it's not a perfect knitting sofa. It's unlikely to accommodate the entire frame of a prone knitter, and the arms are too far apart to prop up the elbows of an upright one while s/he works. What knitters truly need, apart from the classic rocker, is a comfy chair to can sink into for relief from a busy day... and then get up out of if we really have to. Entertainment nearby, in the form of people who also need good chairs, or a TV running movies, or a stereo for music, or a table for your audiobook player. And of course, a place to set a plate of cookies and a cup of tea. 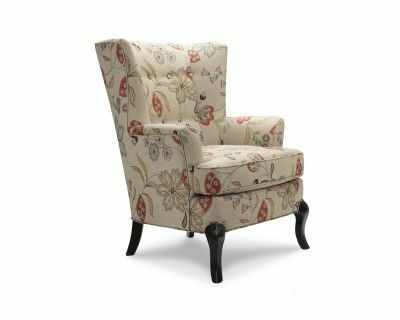 The matching armchair (36" square) will fit perfectly into our new, large, sundrenched front hall as a welcoming sight upon entry and a comforting spot for shoe-donning upon exit and a midafternoon knitting space, but would be a space hog in the living room or the dining room. 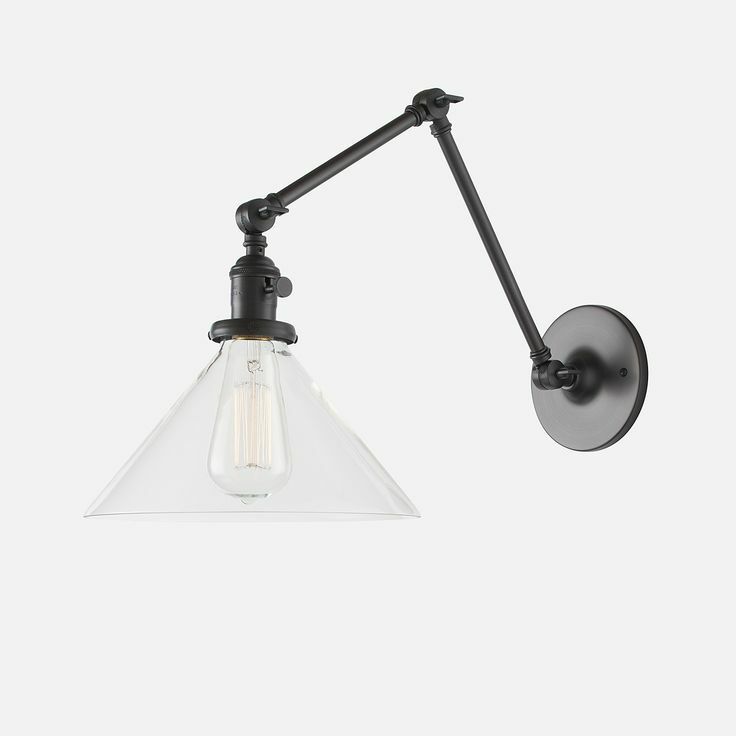 All of which leaves the living room empty and in desperate need of small, clean pieces with airy looking leg areas. It's only 65" long, which is probably still pushing it for the living room, but at 36" deep it'll feel luxurious. 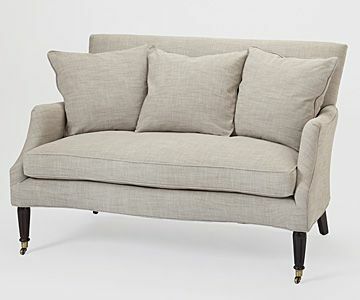 The low, straight arms mean I can sling my legs off the end if I am lying down to watch a movie, and that we can snug a small side table right up to it. 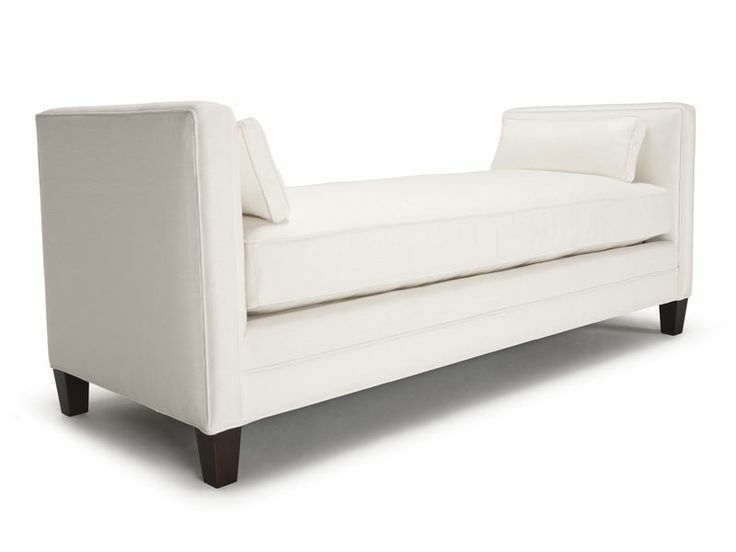 Also, Barrymore Furniture builds all its own furniture and does custom work beyond just upholstery, so worst case, I can have it shrunk down the littlest bit. For chairs in this tiny room, I am torn. 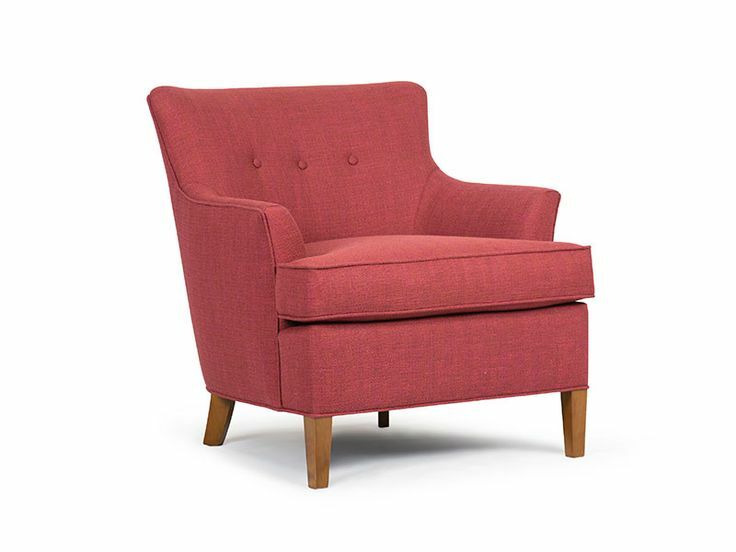 The design of this William Chair (also from Barrymore) is pretty midcentury modern for my preference, but you can't argue with its 31" x 31" footprint. 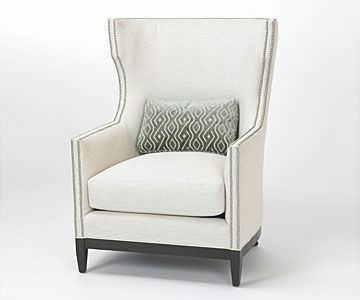 But I really like the idea of this wingback from The Art Shoppe paired with the sofa from Barrymore, don't you? They look like they're from the same set, without being too matchy. Swoon. And - oh dear, what about a pair of tiny compact chairs for sitting by the fire after we've pushed the dining table a bit out of the way? The William chairs with their 31" dimensions would probably be great here, but I sat in this traditional wingback while we were deciding whether or not to buy the big sleeper sofa at The Chesterfield Shop and it is SO COMFORTABLE. I'm not really a fan of the legs, but the curl of the back and the height of the arms feels fantastic when you're sitting in it. Also it's got a 32" square footprint. The question is, which style goes better with this expanding dining table? H'mmm... probably neither. But I do like the very stable central base on that table, the better for walking around while smoothing pattern pieces over fabric while cutting out sewing projects! At least it's only three different furniture stores we have to go to for a seating check, right? Here's what I'm really happy about though: I've finally got a solution for the open 76" x 30" slot in my office! In addition to a long desk and much-needed storage for yarn and fabric, I wanted a comfy seat in there for quiet knitting. Because the space is so tight though, it also has to serve as a credenza for spreading out papers, and a staging area for sewing projects in progress. And I want to be able to nap on the comfy seat if necessary. I mean come on, who doesn't need a nap after doing all that paperwork and sewing?? It's 31" deep but I think I can work around that, don't you? And if not - again, it's Barrymore, and they can make it smaller for me. Can't you just see it with some big colourful cushions to lean back on for gazing at the view of treetops, and a cheerful throw blanket, and some pull-out storage underneath for on-the-go knitting? And while I'm asking you things - have you noticed that all of this furniture is boxy and spartan? I just did, putting it all together here. I'm not really a boxy or spartan person, but I have a feeling the fabrics and patterns we end up choosing would make even this stuff look curvy. Okay, enough dreaming. If we're going to check out all these places over the Christmas break, I'd better step up the pace with getting our other stuff done! Take care and I hope I see you again soon. 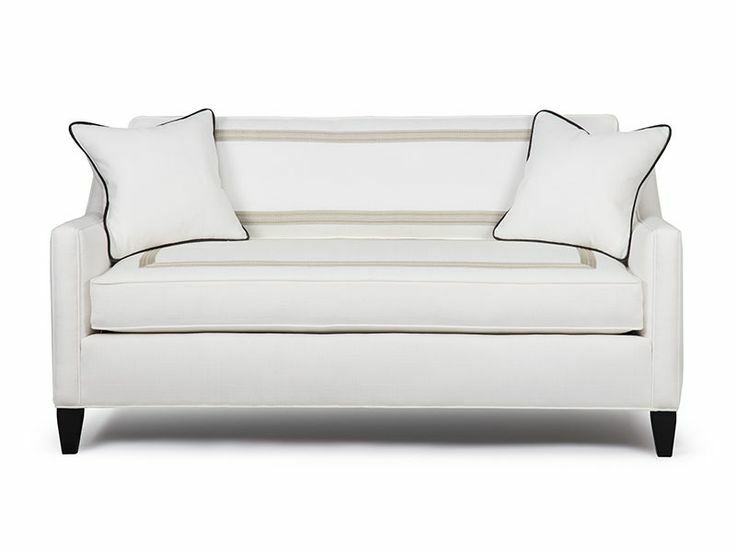 Love the office sofa! When I eventually get my craft room, I will have to be very creative just to get a knitting chair in there! Have a wonderful and relaxing festive season.